On the far side we stopped to celebrate our continued status as living creatures. Six miles of rolling tarmac led to the town of Beverly. My friend Paul had an idea: ride mountain bikes three hundred miles from near Seattle to the Idaho border via the unpaved John Wayne Pioneer Trail. Larry, Trevor and I liked that idea. Paul secured the required permit, mapped our route, and even pre-rode a couple of dicey sections. We planned four to six days, and cleared our schedules from September 19th through the 24th. I didn’t have my bike fully loaded until 6:30 the night before departure. Fifteen hours later the four of us were pedaling eastbound from Rattlesnake Lake. We hadn’t gone ten miles when Paul noticed that he’d broken a spoke in his rear wheel; we crossed our fingers and hoped that the wheel would make it to Cle Elum – forty miles to the east. We made it, but the lone bike shop was permanently closed. 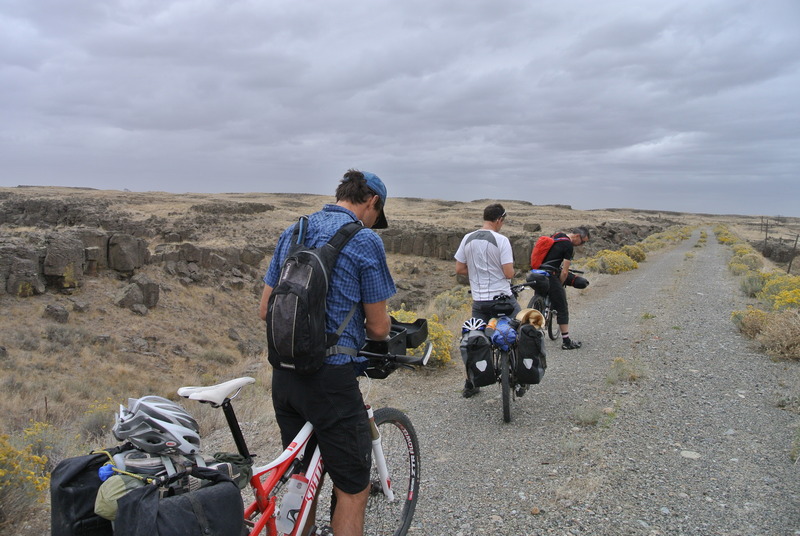 We now had to get the broken bike twenty five miles to Ellensburg. Paul decided to hitchhike. Larry, Trevor and I couldn’t come up an alternative, so we left Paul with his thumb extended. An hour later I received the following text: Hitchhiking a bad idea, I’m following. Paul managed ten miles before a fourth broken spoke left him dragging his bike five miles towards an AM/PM where he would await his wife Vicki and a new wheel. Meanwhile Larry, Trevor and I rolled into the Ellensburg KOA at around 6:30. Paul called at around eight; he’d made it to the AM/PM, and was exhausted. That evening he slept in a hotel room with his wife and his bike. The next morning we met Paul and Vicki at Perkins. Paul had rallied his inner troops and was good to go. We rolled easy through the Kittitas Valley, but managed to miss a critical detour ending up at a junkyard behind a burned out mobile home. We passed the well-done trailer in silence hoping not to wake any sleeping creatures. We hefted our bikes up and over the locked gate and onto legitimate tarmac, bullet one dodged. The next twenty miles of trail pass through the Yakima Military Training Center. After a few rough detours, and some soft sand we began the ten mile descent into the Columbia gorge. The rail trestle spanning the Columbia at Beverly is blocked with chain link and razor wire. The Wanapum Dam, a mile upriver, is also off-limits, so our only option was to ride six miles north to the town of Vantage, where we’d have to ride I-90 across an extraordinarily bike unfriendly bridge. We camped in Vantage dreaming of light Saturday morning traffic. We all woke up eager to put the Columbia behind us. Paul lit a flare on the western edge of the bridge deck as two side-by-side tractor trailers screamed by. I yelled ‘go!’ and Trevor started the sprint. I was eight inches off his wheel, as he spun out that single speed. There is no shoulder; cars and trucks buffeted us at seventy miles an hour as we pounded the pedals. On the far side we stopped to celebrate our continued status as living creatures. Six miles of rolling tarmac led to the town of Beverly. Beverly is an odd sort of modern day ghost town made up crooked buildings and dilapidated mobile homes. We rolled through in silence hoping to go unnoticed. We found the Trail and rode quickly away. As we approached the three farm houses known collectively as Smyrna, I looked down to see three dozen goat head thorn balls piercing both tires. Goat heads, also known as puncture weed, had lived up to their name, and I spent the next twenty minutes attacking the iron-hard thorns with a Leatherman tool. We rode into Othello hungry, and I scanned the parking lots for taco trucks. We settled for Subway. Two miles short of Warden we found an RV park where we dined on leftover Chinese food donated by a neighboring camper. The next morning we rode into the deserted farming hub of Warden, Washington. The grocery store was open, but it stocked neither the coffee nor stove fuel that we needed. We found the JWPT at the edge of town. It was good to be back on the rhythm of the trail. We rode, talked, laughed; I was having a great time. We arrived at the town of Lind, “Home of the combine demolition derby,” at noon; the town was devoid of human presence. At the local grocery store Trevor and I snatched the last two hot dogs out of the Plexiglas warming box, Paul found a sandwich and Larry microwaved himself a frozen burrito. East of Lind the JWPT passes through some impressively desolate country. 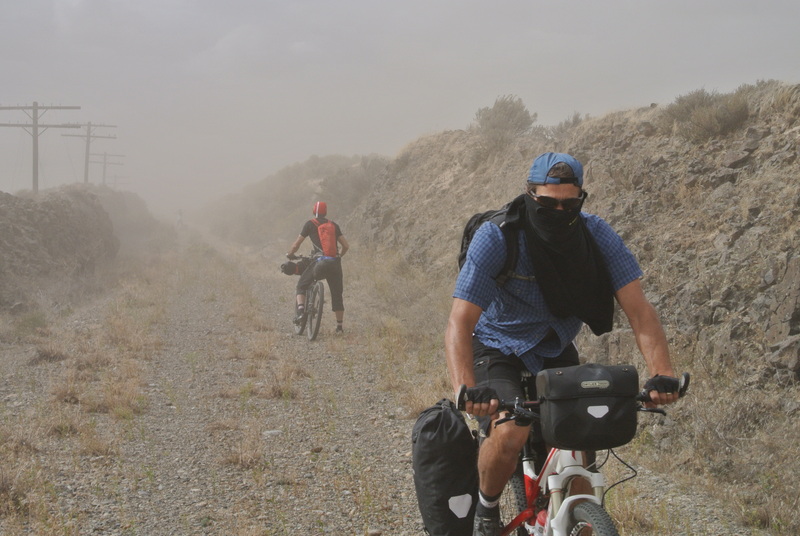 We rode through a dust storm with shirts tied over our faces en route to the one house town of Ralston where we thankfully found a tap at a small memorial park. Black clouds blanketed the sky. The rain was steady as we neared the chasm of Cow Creek. The DNR representative had warned Paul about an unreasonable rancher, and strongly advised that we take a twenty mile detour up through Ritzville; let’s just say that’s what we did. We pushed eastward until dusk. Our campsite was a rocky ditch beside the railroad grade. A steady rain fell as we ate the last of our respective dehydrated dinners. On the morning of our final day we were on the trail by 7:30 am. We were stopped at a church in the hamlet of Ewan filling bottles when a local informed us that one of the tunnels along Rock Lake was blocked. We decided to take the ten mile gravel road detour. This meant missing one of the more scenic portions of the JWPT, but the beautiful rolling scenery of the Palouse made up for the loss. We intercepted the trail at Pine City; we rode past Malden and onto Rosalia where, once again, we dined on grocery store fare. East of Rosalia we stopped to pick wild apples – the small sweet fruit was a real treat. We were right on time to meet our ride when we crested the hill and saw the border town of Tekoa, nested in the rolling hills. We were done, it was three hundred and twenty miles and I’d loved every minute of it, our first epic ride on the John Wayne Pioneer Trail. Ed. note: Mike makes Greenlite pants here in Seattle, our new fav and shared this story with us. Earlier this year, we rode part of the John Wayne Trail, the start of it, through a long tunnel.